At ECCI, we have a very simple vision for the future: we want to see a thriving zero-carbon world. Of course, getting from where we are today to where we want to be is the grand challenge that faces us. But we live in a world in which radical, disruptive change is becoming the norm. In areas as diverse as politics, new social norms, new business models, the power of data and information technology, and in engineered materials, many of the old certainties are being discarded. We want to explore how these social, business, technological and political changes will impact on the delivery of a thriving, zero carbon world. To do this, we are starting a regular blog, drawing on ECCI staff, friends of ECCI, and invited writers. We want to tease out some of these critical issues, to challenge ourselves, our members and our stakeholders, and we want to share some of the exciting developments occurring around the world. From data driven innovation in energy – think smart meters and phone apps that reduce the costs of warming your home – to re-designing everyday products and services that create no waste, from new government climate regulations to how communities organise themselves, we will ask what matters and how it will affect our households, communities and businesses. At ECCI, our ethos is that no one individual or organisation has all the answers. We must be open to engaging and harnessing knowledge from diverse sources and organisations. We also firmly believe that zero carbon leadership is needed at all levels of organisations and society. We need to recognize the potential for leadership from around the world and help develop it wherever we can. So, ECCI works with civic society in cities, regions and states. We work with entrepreneurs and small enterprises. We work with large corporates. And we work with Universities. We are keen for you to engage. Whether you agree or disagree with our ideas and views, or think you know better and want to contribute yourself, please let us know. 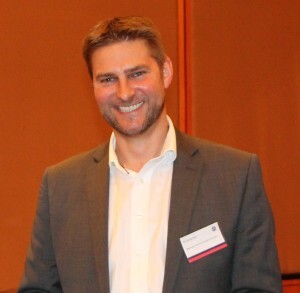 Director, Hong Kong Centre for Carbon Innovation Ltd.
Last week ECCI, along with our partner, the University of Edinburgh, announced the appointment of a renowned Hong Kong sustainability expert to head up our Hong Kong centre. Dr Shelley Zhou (pictured) will lead the University of Edinburgh’s Scotland Hong Kong Carbon Innovation Centre at the Hong Kong Science and Technology Park. The Team Scotland Centre is led by the Edinburgh Centre for Carbon Innovation (ECCI) and is funded by the University of Edinburgh, Edinburgh Napier University, BRE Scotland and Scottish Development International. At a Hong Kong reception sponsored by Pinsent Masons LLP and attended by Team Scotland 2016 Trade Mission businesses and ECCI’s Head of Innovation Ed Craig, Dr Zhou spoke about her vision and ambitions for HKCCI. Ladies and gentlemen, colleagues and friends, good evening. It is a great honour for me to be here as CEO of the Hong Kong Centre for Carbon Innovation. I’m also really pleased to be part of this new initiative – because Edinburgh University is the first education institution in the world to establish a low carbon research and innovation centre overseas. I’ll talk more about our plans for the Centre in a moment, but first let me introduce myself. My name is Shelley Zhou. I grew up in Wuxi, a city near Shanghai. I trained in Environmental Engineering in Shanghai and Hong Kong and took my PhD at the National University of Singapore. After attending the UN Climate Conference in Bali in 2007, I became one of the very first carbon consultants in Hong Kong. I then set up the sustainability function at the Hong Kong Jockey Club and was in charge of the Club’s sustainability performance and reporting over the past 7 years. At the same time I’ve been teaching at Hong Kong universities. My aim is to use my technical expertise, academic network and corporate experience to help the Hong Kong Centre for Carbon Innovation establish itself as a major driver of, and partner for, low-carbon innovation in Hong Kong and Mainland China. So let me now turn to explain a bit more about the Centre and our objectives. The late Prof. C.K. Prahalad pointed out that big social and environmental challenges present immense untapped market opportunities. He urged companies to create what he called “Next Practices”, since incremental improvements to existing practices are simply not adequate. Next Practices are about innovation: imagining what the future will look like; identifying the mega-opportunities that will arise; and building capabilities to capitalize on them. The Hong Kong Centre for Carbon Innovation is all about Next Practices. The Centre will act as a hub to bring together Scottish and Hong Kong talent, resources and ideas to create an incubation space for new low carbon ideas, products & projects. It will focus on areas such as sustainable construction, green transportation, energy efficiency, resource management and smart cities. To facilitate this, we will create a team dedicated to identifying, brokering and accelerating Scottish-Hong Kong partnerships, providing a gateway to Mainland China. And we will share and develop best practice with the Hong Kong Government and with academic and business partners. Backed by the University of Edinburgh and our three partners, we will provide executive courses, short courses and training to share the latest low-carbon technologies and solutions. Looking ahead, I also believe that as more and more Chinese companies are going global, we should think about how to help these companies adopt low-carbon solutions when they go overseas. Now one question you may ask – what knowledge does a Scottish institution have that we don’t already have in Hong Kong and Mainland China? My answer is that the task we are faced with globally is huge – according to the Paris Agreement to keep global warming below 2°C. To tackle this challenge I think we need to maximise our knowledge base – to share and learn from each other. In Mainland China especially, where the UN Environment Programme estimates it will require around €500 billion a year from 2016 to 2020 to finance its national environmental goals, there is an urgent need for innovative ideas and fresh thinking. So my aim as CEO is to facilitate this knowledge exchange. To bring talent together to explore new low-carbon opportunities, which can benefit Hong Kong and Mainland China, and may also have applications elsewhere. I am very excited about the prospects ahead. The Edinburgh Centre for Carbon Innovation has already established itself as an effective forum for promoting low-carbon solutions. And by establishing this new centre in Hong Kong I look forward to it building very effective partnerships between Scotland, Hong Kong and Mainland China as we work together to build a sustainable and low-carbon future for all. Later this month ECCI will launch its first base outside Edinburgh in Hong Kong. The Scotland Hong Kong Centre for Carbon Innovation (SHKCCI) will provide a conduit for Scottish organisations aiming to create local partnerships and introduce products and services to Hong Kong businesses. The Team Scotland Centre will be led by the Edinburgh Centre for Carbon Innovation (ECCI) and is funded by the University of Edinburgh, Edinburgh Napier University and BRE Scotland. Look out for more news on our website soon. Below we hear from Kate Armitage, from Scottish SME Route Monkey, about her experiences on her first trip to Hong Kong in May. Kate will return to Hong Kong with eight other ambitious low carbon enterprises to help launch the new SHKCCI later this month. At the end of May ECCI ten Scottish companies took part in a shared initiative between ECCI and Scottish Development International initiative to share best business practise ideas with Hong Kong and Chinese counterparts. For a full itinerary and list of the companies who made the trip visit our website. Expanding a business internationally can be daunting for a small business like Route Monkey. So when we were offered the opportunity to join a trade mission to Hong Kong, along with other fast growing Scottish SMEs, I was very excited. We already work with fleets operating in most UK towns and cities; and the potential for Route Monkey to create a positive impact in Asia helping to tackle their current challenges with road congestion and poor air quality was too good an opportunity to miss. Route Monkey specialises in the development of algorithms and software that drives efficiency in the fleet logistics sector, ensuring the right vehicle is in the right place, at the right time, with the right driver. We help fleets save money by reducing mileage and carbon, and helping fleets model the potential for ultra-low carbon vehicles such as electric or hydrogen. This ‘win: win’ approach has seen us grow to over 500 customers in the last 9 years, including working with high-profile retailers such as Iceland and Net A Porter. This practical, low-risk approach, translates well into international markets with large road transport fleets, using over stretched road infrastructure that need to reduce their carbon footprint. Perfect for Hong Kong. 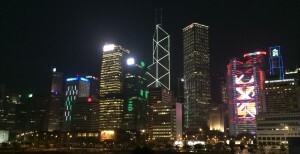 I arrived in Hong Kong slightly nervous, having never travelled to Asia before either for business or pleasure. But my reservations were allayed as soon I arrived at the airport; the signage was in English and the train service (TMR) that runs from the airport to Hong Kong Island was easy to use, reliable, clean and fast. First impressions count, and throughout the trip I learned that public transport in Hong Kong (train, tram, bus, taxi) is the mainstay for well over 90% of the population. Perhaps because Hong Kong is a former British Colony, English is widely spoken, both in business and hospitality, which makes life much easier. I was treated with courtesy and received a very warm welcome from our hosts. Of course, much of the credit for the organisation and our reception in Hong Kong, is thanks to both ECCI and SDI who had prepared an impressive and busy itinerary for the group throughout the visit. I met with high-profile companies including: Marks & Spencer, Swire, Wah Kwong, Octopus, The Hong Kong Jockey Club, Poly U and CLP (China Light & Power). I also learned more about the local economy, legislation and environmental issues in a series of meetings with Invest Hong Kong, The Climate Group and Business Environment Council among others. All in all it was an excellent itinerary that has given Route Monkey an overview of the market opportunities and introduced us to some of the most prestigious companies in Hong Kong. What next? I have already been in touch with my new contacts and I am hoping to schedule a second visit to Hong Kong shortly to develop these relationships. Route Monkey is continuing to work closely with ECCI and SDI, and we are planning to rent hot desk space from ECCI at the Hong Kong Science and Technology Park. It is a fantastic facility that will allow Route Monkey to operate an office in Hong Kong while keeping overheads to a minimum. At the same time we have an opportunity to network with the Smart Mobility cluster located at the Park and utilise the TecONE zone designed to support new business innovation. We are still very much at the beginning of our market entry to Asia but, with the support of ECCI and SDI, Route Monkey is genuinely excited about the potential to take our products and services global. We ask Low Carbon Ideas Lab resident Karen Finlayson, CEO of Colour Elements, about the recent Hong Kong Mission. It just shows that when you’re starting out you’ve got to put yourself out there. You never know when or where you’re going to make the next connection or meet the right person. And there’s no shortage of opporutnities to do that at ECCI. What does your company, Colour Elements, do? Colour Elements offers inspiration for worn-colour through digital products and training for leaders within retail, business and politics – reducing wasteful consumption of clothing. I successfully pitched to join ECCI’s Low Carbon Ideas Lab last Autumn and have been soaking up as many of the pitching and networking opportunities ever since. As an early stage business I want to take every opportunity I can to get my message out there so when the opportunity cam up to go to Hong Kong I jumped at the chance. The overall aim was to introduce Scottish companies to senior Hong Kong business, academic, voluntary and government representatives, explore potential partnerships and customers, and hear from experts regarding policy drivers, regulatory landscape, business environment and key business opportunities. Hong Kong is a major financial centre with a population of seven million people, so it provides a unique and exciting opportunity for Scottish businesses focused on low carbon products and services. And as the ‘Gateway to China’ it also offers access to an even greater market. It was incredible packed week for me and the other delegates (see the list below). We attended the City Carbon Vision 2015 conference, an event tackling green action and investment in the buildings sector to reduce carbon footprints at the Hong Kong Jockey Club. I was asked to speak in a discussion panel about my role within the sustainable fashion as part of the ‘Creating Smarter Buildings for Cities’ session. ECCI also put together a series of high level meetings with organisations and corporations interested in Scottish low carbon products and projects such as UKTI, Invest Hong Kong, Swire Group, China Light and Power, Marks & Spencer, HK Jockey Club as well as Universities such as PolyU, Tour & networking reception at the Hong Kong Science and Technology Park (HKSTP). What did Colour Elements get out of it? I got a great response from the delegates at the conference. Shopping is a major past time and tourist attraction and waste is already a major issue because of the high density population so there is a massive opportunity for sustainable fashion in Hong Kong. I was also able to meet up with some Hong Kong based fashion bloggers I follow on twitter and will be following up this week with the Professor of Fashion and Technology at PolyU. As well as the planned meetings I had a piece of good fortune when I bumped into the founder of EcoChic – the world’s largest sustainable fashion design competition – at a networking event. It just shows that when you’re starting out you’ve got to put yourself out there. You never know when or where you’re going to make the next connection or meet the right person. And there’s no shortage of opporutnities to do that at ECCI. It is perhaps inevitable that it takes a visit to Hong Kong to learn intriguing facts about the University of Edinburgh. In a week of striking statements, I learnt that the University has more Chinese students than attend all the Ivy League Universities put together; and more than Oxford and Cambridge Universities together. This is fertile territory for us to be exploring potential partnerships that can help us better understand Hong Kong and China’s strategic challenges, against which we can identify who is best placed in the University – and more widely – to provide effective research insights that can deliver positive impacts. 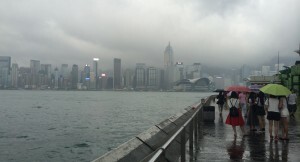 Pressing challenges in Hong Kong include the desire for a “liveable city”: tackling issues such as wasteful energy use in buildings; traffic congestion and poor air quality from vehicle emissions; waste utilisation, given the limited space available to landfill; and water management, to cope with the increasingly extreme rainfall events. We had a taste of tropical rainstorms during a “red weather warning” period in midweek, when 2 inches of rain (50mm+) fell in an hour. This storm contributed to long delays for air travellers, including for our senior Vice-Principal and party. The same storm contributed to substantial flooding – and some loss of life – elsewhere in southern China. This trip re-emphasised to me the huge opportunities for the University to apply its research insights – from many different disciplinary backgrounds – to help tackle pressing social challenges in Hong Kong and more widely in China. The University has a huge advantage in being able to draw on our extraordinary alumni to build the partnerships necessary to translate research insights into practical action. At the Edinburgh Centre for Carbon Innovation we work with low carbon leaders and practitioners from business, finance and the public sector. The centre focuses on large-scale low carbon projects and helps companies create new kinds of low carbon products and services. 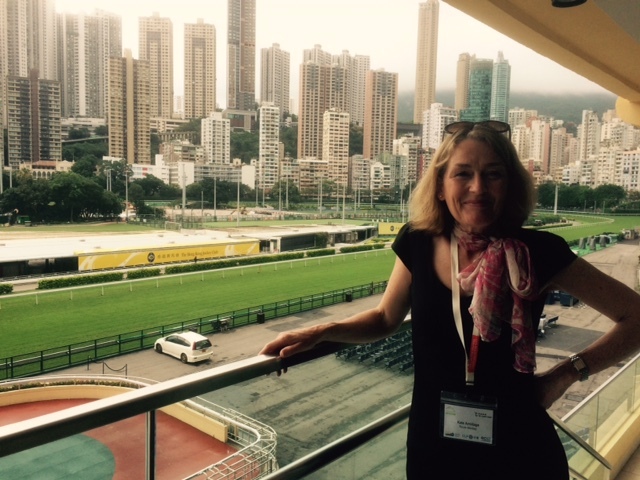 Our packed week in Hong Kong included a conference on low carbon cities, run by the Climate Group, sponsored by ECCI and hosted by the Hong Kong Jockey Club, an unusual not-for-profit organisation that provides around 10% of Hong Kong’s entire tax revenue. We explored future partnerships with key organisations and individuals, showcased some innovative Scottish companies to Hong Kong partners, and visited our proposed new University office at the stunning Hong Kong Science and Technology Park. It was also valuable to meet past and future students and current colleagues at the events organised by the University’s Development and Alumni team. The final intriguing fact of the week? There is an official Chinese tartan, bringing together the red and gold of China and the blue and white of Scotland. View Vijay’s Slides from the February ECCI residents’ Carbon Chat Room. From November to January I was in India along with my colleague, Anna Harnmeijer. The trip was part of an ongoing project, seed-funded through the Scottish Government International Development Small Grants Programme. This is the first field trip in a three year long project which aims to pilot a communications solution to halt the decay of off-grid renewable energy projects in rural parts of the state of Odisha. The problem definition and premise of our solution is explained properly here. In short we are looking to improve supply chain communications using SMS Gateway technology and data connectivity to ensure that local entrepreneurs are able to create profitable businesses from maintaining small-scale solar energy projects – leading to a situation in which repairing systems is viable. At the moment the expertise and parts required are often not available locally, leading to minor issues crippling projects and an inability for problems to be fixed. From a UK perspective this is a fascinating problem. We are used to seeing standardised O&M contracts in projects that are usually the pride and joy of the communities in which they sit. The story is far different here. Most projects are largely or entirely private donor, or Indian Government driven, meaning that villages have systems given to them for free, or for a small part-payment. This leads to an uncertainty over who owns the systems and who is responsible for upkeep in the long term. Once initial warranty periods are over projects are left in precarious positions, with provision of maintenance services offered in a somewhat ad-hoc manner from the project donors and implementers. Once illuminated, many of the people in the 25 villages we visited, tell us that they now value electricity and would be willing to pay for their systems to be refurbished. Therefore, we aim to help implement a system that involves at least partial payment for services. We believe that the trick here is to make sure that the supply chains are localised and communications up and down the chain are easy and transparent. This problem is being widely recognised by project implementation agencies and donors alike. We look forward to working with them to help ease the issue, starting with a pilot project towards the end of 2015. This project is a collaboration between our organisation, Scene Consulting, the University of Edinburgh, in the shape of Dr Jamie Cross, and Indian organisations SELCO and TERI. Jamie and myself will be presenting the project at the Carbon Chatroom, 19th February 12:30 -13:30, at the Edinburgh Centre for Carbon Innovation. Vijay has an Earth Science background and is a specialist in renewable energy development, energy finance and modelling. He takes the lead of Scene’s consultancy work and has a broad knowledge of renewable energy technologies, especially, wind and hydropower, and is proficient in several economic techniques. He has a good understanding of project development processes in the UK and is able to help clients to navigate the technical, legal, environmental, planning and financial barriers that they are likely to face. Vijay has initiated and developed some of the most leading-edge joint venture partnerships in the UK to date. Vijay has experience in all sectors, having worked for two charities before making a move into the private sector, giving a rounded approach to stakeholder engagement and project planning. Vijay is an adept project manager as has managed many small-to-medium, and several large (> £1m) projects over the past 5 years. 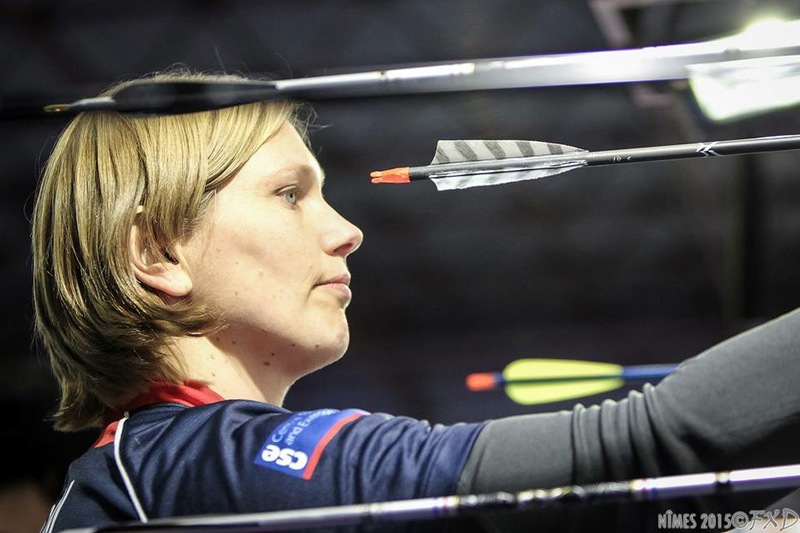 Congratulations to ECCI resident and champion archer Victoria Barby.